Passengers are welcome to board our ship at 6:00 p.m. After comfortably settling into your cabins, we'll introduce our crew at a welcome cocktail. Our ship will start cruising towards Saint-Nazaire during the night. CLASSIC: Tour of Saint Nazaire, a town on the sea. We'll visit Escal'Atlantic, a museum that explores the historic ocean liner experience, and the Saint-Nazaire shipyard, one of the largest shipyards in Europe (this excursion must be booked in advance through your travel agency. Each passenger will be asked to produce a valid passport in order to gain access to the shipyard). CLASSIC: Guided tour of Guérande, a fortified medieval city entirely enclosed by ramparts. We'll discover the process of harvesting Guérande salt, the undeniable symbol of the region. DISCOVERY: Hiking in Guérande. Take a hike along the ramparts through the medieval city of Guérande and discover its salt marshes. The afternoon will be spent cruising towards Nantes. In the evening, join us on an excursion for both packages: we'll board a local boat for a cruise on the Erdre River, one of the most beautiful in France. CLASSIC: Guided tour of Nantes and the Castle of the Dukes of Brittany. DISCOVERY: Nantes, the Machines de l'Île, secret courtyards and covered passageways. Enjoy onboard entertainment as we cruise towards Ancenis this afternoon. CLASSIC: The Muscadet Wine Route and Clisson, a charming medieval town. DISCOVERY: Helicopter ride(3), the Loire from above (this excursion must be booked in advance through your travel agency). Our cruise continues to Bouchemaine. Enjoy an evening of entertainment. CLASSIC: Guided tour of Angers, its historic districts and the famous Apocalypse tapestry. DISCOVERY: Tour of Brissac castle and its cellars complete with a wine-tasting session*. In the afternoon, we'll set out for an excursion for both packages: Guided tour of Saumur and the Cadre Noir(1), which is on the Representative List of the Intangible Cultural Heritage of Humanity, and visit of the fortified city of Saumur. Enjoy an evening of dancing. Join us on a full-day excursion for both packages to discover the Castles of the Loire Valley. Enjoy an evening of entertainment. CLASSIC: Excursion along the Angevine Corniche with its picturesque villages and many viewing points along the Loire. DISCOVERY: Enjoy a scenic bike trip along the Loire River including charming typical villages. The afternoon will be spent cruising the Loire towards Nantes. Tonight's our festive gala dinner and evening. Enjoy one last buffet breakfast on board before disembarking at 10:00 a.m. End of our services. Go on a splendid journey discovering the treasures of the Loire. Visit Nantes and its historical jewels, Guérande protected by its strong ramparts, quoted to be the Dukes of Brittany's favorite and famous for its medieval monuments as well as for its salt marshes, and the Escal'Atlantic of Saint-Nazaire. You will also discover the impressive Cadre Noir at Saumur well known for it master class equestrian skills, as well as the Angevine cliffs rising up to over a hundred meters and offering you an impregnable panorama over the Loire valley. The cruise schedule may vary according to tides and arrival times at ports of call may be subject to change. (1) Guided visits do not guarantee that you will see the riders and horses at work during the visit, particularly if the Cadre Noir de Saumur is away, or during competitions. 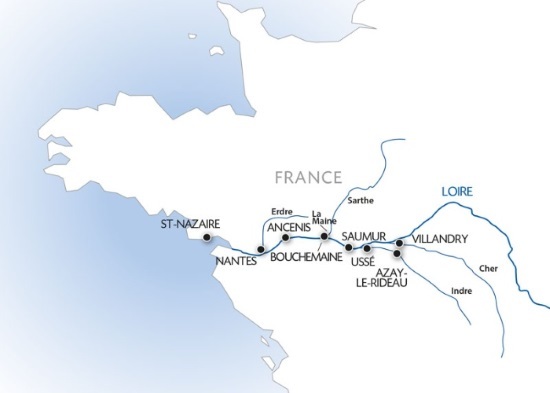 (2) Depending on docking availability, the stopover in Bouchemaine may be replaced by Chalonnes-sur-Loire. In this event, the order of the visits could be altered.